One of the most viscerally appealing parts of the Arts & Crafts idiom is the extensive use of oak in furniture, accessories, and construction. The oak tree seems to define strength and stability, and is inextricable from the words 'stalwart', 'steadfast', 'enduring', 'tough', 'mighty', 'solid', and a host of other related ideas. The wood is the choice of craftsmen who build to last, for two reasons: It's strong, and it's beautiful. There are other beautiful woods, and there are other strong woods, but few combine the two qualities with the challenge that working with oak represents. It takes a certain understanding to work with oak, but when you're done, the satisfaction is not to be compared. There are two primary reasons that oak is so pleasing aesthetically. The first reason is that as it grows, oak develops what are called "medullary rays". These are portions of the wood which have a different cellular structure, and hence reflect light differently from the other heart wood. They radiate from the center of the oak log to the bark, and when the log is quarter sawn, the rays are cut at a very low angle which reveals more of their surface than if the log was slabbed off. But there's no denying geometry: Quarter sawing is more labor intensive and produces fewer board-feet of lumber than plain sawing. It's therefore more expensive than slabbed lumber. Plain Sawn Log. The wood is slabbed off so the face of the plank varies from parallel to perpendicular to the medullary rays. Quarter Sawn Log. The log is first quartered, then the planks are alternately slabbed off the exposed faces of the quarters. This makes the exposed faces more nearly parallel to the medullary rays which are therefore more pronounced. 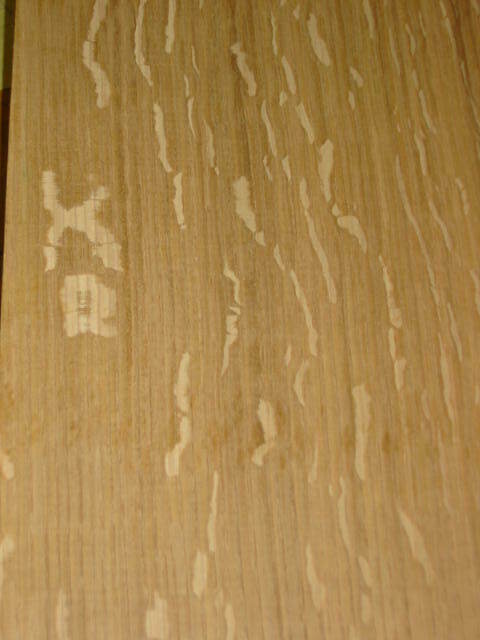 Medullary rays in unworked quarter sawn plank, known as "fleck", or "figure". Medullary rays are most pronounced in white oak, which is why it's the wood of choice in the U.S. for Arts & Crafts furniture. Unfortunately, it's also the wood of choice for making bourbon whiskey barrels. As a result, it's more expensive than other oak, as well as all but the most exotic imported woods. In the distant past, some white oak planks were stored in a stable. When it came time to use the planks it was discovered that the wood had taken on a warm, golden brown hue which was very pleasing. Why, was a puzzlement until somebody realized that the stable where the planks had been stored was full of certain equine byproducts. As they decomposed, the horse apples, etc., released ammonia, which reacted with the tanic acid in the oak to produce the color. So the finishing technique of fuming white oak with ammonia was born. That the medullary rays contain relatively little tanic acid means that they stay the color of untreated oak, providing an emphatic 'fire' in the finished wood. Examples of the 'fleck' can be seen in many of the detail photos of our projects. There's also a subjective element to the mystique of oak. For those of us who work the wood, there's just something about the smell of the sawdust, the feel of the board, the way the shavings peel off the blade, the magic that happens when the shellac touches the fumed wood, that suffused us with a feeling of satisfaction and stability. Everything in the world may be negotiable, but oak is oak.